We’d love your help. Let us know what’s wrong with this preview of Essential Poems and Writings of Robert Desnos by Robert Desnos. To ask other readers questions about Essential Poems and Writings of Robert Desnos, please sign up. Before buying this book I had been hoping for years for a well translated and substantial collection of his work. This is a substantial collection - loaded with poems (in facing French) from all phases of his short life, along with excerpts from his novels, complete essays (including two on film) and articles, AND a lengthy postface that's a leisurely analysis of his works. But I'm still not sure about all of the translations, mainly because I don't know some of the translators, and as much as I Before buying this book I had been hoping for years for a well translated and substantial collection of his work. This is a substantial collection - loaded with poems (in facing French) from all phases of his short life, along with excerpts from his novels, complete essays (including two on film) and articles, AND a lengthy postface that's a leisurely analysis of his works. But I'm still not sure about all of the translations, mainly because I don't know some of the translators, and as much as I like the editorial work Mary Ann Cawes has accomplished in her career, I still don't trust her translations. 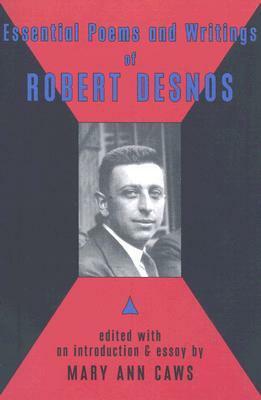 Desnos is famous for being the sleeping surrealist, who could fall asleep in a flash in the midst of a cafe crowd and start uttering waves upon waves of pure surrealism, and he was justly praised and adored for this by Andre Breton; but then Breton got mad at Desnos for writing journalism and for writing rhyming poems (petty petty fascist) and kicked him out of surrealism. But this didn't stop Desnos, as he was pure surrealism, and so continued to pour forth literary wonders until his death at 45, courtesy of the Nazis. Included in the collection is Desnos' "Third Manifesto of Surrealism" wherein he gives it right back to Breton, calling him among other things a liar and a hypocrite. I enjoyed this because it threw into sharp relief Desnos' sharp wit, passion, and anger. In this it provides a welcome and obvious dark side to his other work which, at least superficially, can appear gentle, soft, and dreamy. There is a gentle dreaminess to his writing, but it is deceptive, as so much of his work is written on a blank sheet of death and emptiness and desolation. His was a complex sensibility beneath a veil of simplicity. Desnos is a surrealist in the classic French sense. His themes are love, reality, life, death, uncertainty, and change. His form is free with little punctuation. Line lengths contrast one another to emphasize and vary pace. Here are two lines of varying length from "Obsession:"
I bring a bit of seaweed, which was tangled with the sea foam and this comb. But your hair is more neatly fixed than the clouds with the wind with celestial crimson glowing in them and are such that with quiverings of life Desnos is a surrealist in the classic French sense. His themes are love, reality, life, death, uncertainty, and change. the froth scattered by a tempest. A star dying is like your lips. The extreme length of the second changes both the pace of the poem and emphasizes the simile of the third line. Imagery is important and powerful too. He uses metaphor, but imagery is how he many times communicates his emotion and theme - much like Eliot uses images as "objective correlative." Late in the poem, to show the effect of death around the speaker he uses coldness and stillness and the image of "The mines make a muffled snoring / The roofs are strewn with anthracite." Ice and the darkness of the mine but with a muffled snoring conveys a stillness and lack of energy. Tone, pace, scope, setting, and time all shift between and within the poem. Desnos loves reversals and inversions. He changes the time and setting with the lines "An instant passes with a mine's profundity”, "How cold it is in the impasse where I knew you", and "Before too long I'll find you again near these china-asters." The poem takes the reader seemingly from the sea to the morgue to the afterlife. The tone of the poem goes from romantic to somber when realizing the setting is a morgue rather than the sea and switches again to a tentative hopefulness when the speaker confidently predicts a reunion in the afterlife, but the reader knows that may be wishful. Like the changes of tone, pace, and line length are used for amplification, Desnos changes scope for the same effect: "The earth crumbles and stars screeching like iron across mother-of-pearl / But your neatly fixed hair has the shape of a hand." The change of scope and the juxtaposition between the two lines once again changes the tone and pushes the theme of the speaker's love and adoration for the person. Contrast also amplifies the themes of death, loss, and love. Throughout the poem there runs a contrast between the raging, flowing, lively sea versus the complete deathly cold stillness and the darkness and mystery of the mine. Desnos is a master of other subtle slight of hand techniques, almost trickery, but it all still manages to convey meaning and push theme. Although there are no clear examples in "Obsession," Desnos uses inversion in many of his poems. For instance from "For a dream of day" there's the line "The murder was splendid." The same poem holds an example of a unique touch that Desnos calls metamorphing. In fact the line reads, "...here's a poem of metamorphoses. The swan becoming a matchbox and phosphorous disguised as a tie." "Reversals are also a favorite of Desnos: "Will the schist brighten the white night of cork?" asks the opening line of "At daybreak." Inversions, reversals, and metamorphing add to the tension, energy and amplification of Desnos poems. As does another technique he employs tastefully - repetition. In "The voice of Robert Desnos," the speaker pleads, demands, and begs all at once as seen in the repetition: "I summon flesh / I summon the one I love / I summon the one I love / I summon the one I love." The repetition changes the declaration to desperation. Desnos poems are dynamic. The tone changes, the shifts in pace, the imaginative images, juxtapositions, contrasts, changes in setting, shifting of the timeline, and metamorphing create poems full of vitality and energy. The reader’s imagination is turned on to the fullest and the faculty of interpretation has to be ignited or the reader will be left stranded. Desnos holds no readers hands through the poem, but he gives enough information and context to allow for readers to understand in general what is happening in the lines. Therefore his poems engage the reader. It is powerful. I believe this is the only bilingual selection of Desnos currently in print. For that reason alone this book is invaluable; Desnos, more than any other of the surrealists, loses much in translation (see Martin Sorrell's extremely questionable "Hour Father" in this selection). I have some issues with Caws's translations of Eluard and Breton but she seems much more inspired with Desnos's work. great writing... but the translations are iffy and in some cases completely up to interpretation. Still stunning pieces of work. Like the title says: these are essential. A real tour de force. Finally, there is a great big gathering of one of the most significant of the French Surrealists. Desnos--always mysterious--always delights.